Worldwide, many infections remain undiagnosed and untreated due to poor diagnostic tools. 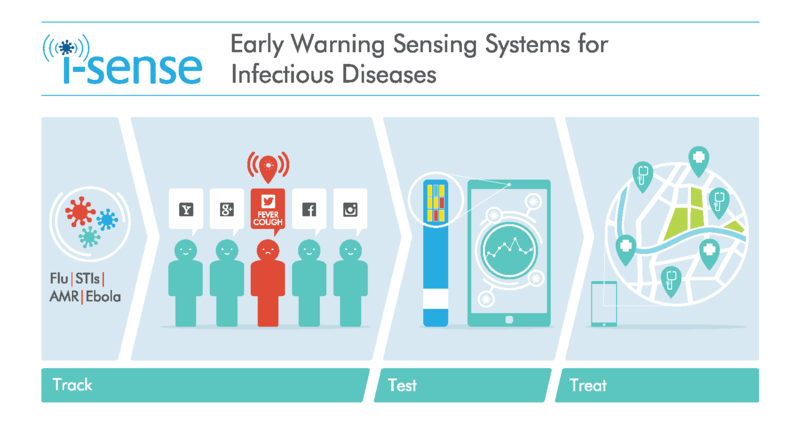 i-sense is engineering new digital tools and technologies to help track, test and treat infectious disease. Our researchers are working to harness the power of mobile phones, biomedical engineering, nanotechnology, genomics and big data to detect diseases much earlier than ever before, helping people gain faster access to care and protect populations. We are exploring how self-reported symptoms via social media (Twitter) and web searches (Google) to help track early indicators of infectious disease outbreaks. This could allow us to detect infection even before people attend clinics and in regions that lack the resources for traditional public health systems. We are creating low-cost, user-friendly, mobile phone-connected tests to accurately diagnose infections at point-of-care, supporting front line health workers and self-testing. These tests could widen access to testing and provide faster results, protecting patients and populations in the UK and developing countries. We are embedding diagnostic tools and digital technologies into new models of online patient pathways to understand how they can impact treatment and care for people in the UK and developing countries. The ability of mobile phones to connect test results into healthcare will help public health systems identify unusual disease clusters to prevent spread of emerging infections and also to ensure patients receive rapid treatment and care. Our core, interdisciplinary research program brings together expertise across the i-sense consortium in diverse areas, including biomarker discovery, biomimetic coatings, nanosensor systems, data capture, data analysis and early-stage clinical and economic evaluation of our technologies.